Incursion, or Space Hulk 2.5, is a game with a huge amount of promise. Unfortunately, in my opinion, it fails to deliver on that promise. It's a game that I have been interested in trying for quite some time, but I was never prepared to pay the high asking price to get a copy. I finally got my chance to own it when I was approached by someone on www.BoardGameGeek.com who wanted to trade for my copy of Age of Mythology. I wasn't particularly fond of Age of Mythology, so I was happy to make the trade. 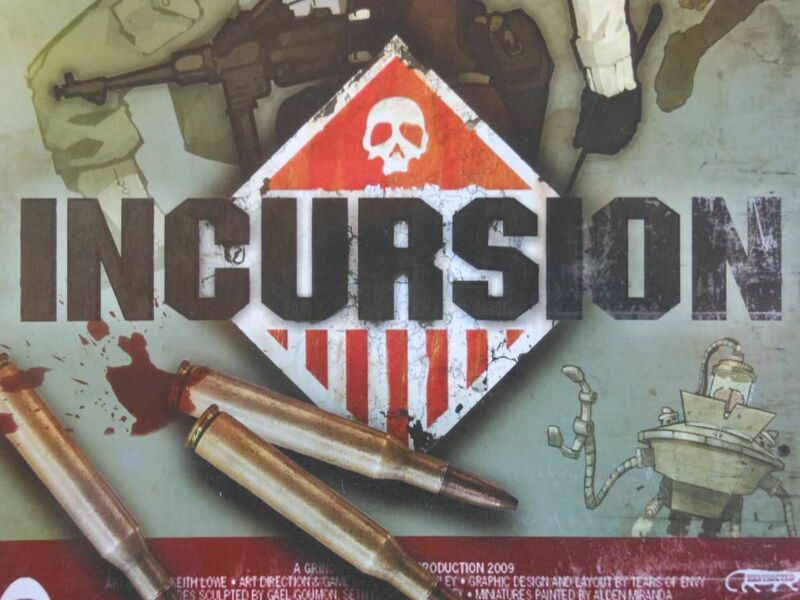 Now, by the time this deal was agreed, I already knew that Incursion was going to get a reboot through Kickstarter, a website that allows artists to get the money they need through crowd-funding. The new edition was all chromed up, with plastic miniatures (and a suitably high price tag), so I saw my trade as a way to try out the game to see if I liked it before dropping serious money. I love Space Hulk. I was a huge fan of the first edition of the game, and I now own the super shiny third edition. Sandwiched between those two editions was a version of the game that was pretty terrible. It removed the sand timer element for the marine player (removing all the frantic excitement and sense of urgency that came with it), changed a bunch of rules, and had a horrible flamethrower mechanism that was just fiddly. 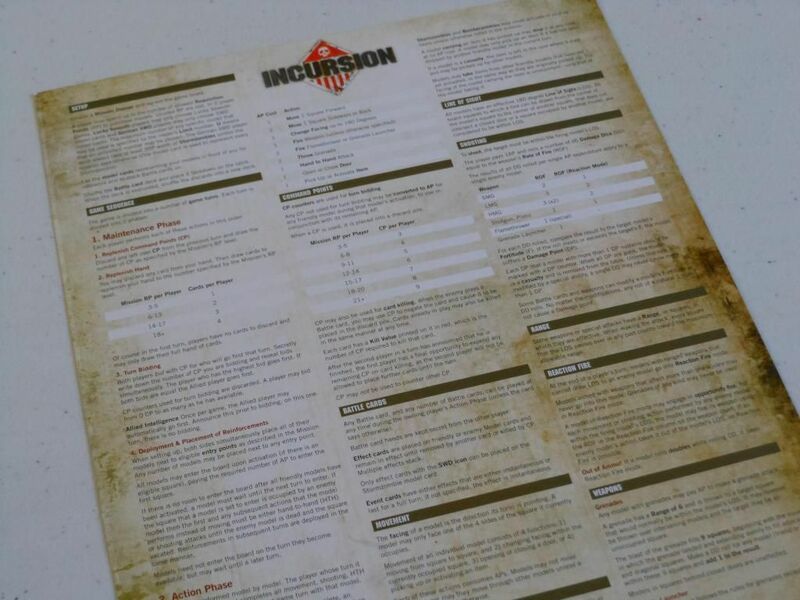 While Space Hulk was out of print, the first edition of Incursion came along. It was quite open in what it was trying to do: It wanted to provide a game experience that was akin to Space Hulk; and it wrapped up that idea in a really rather groovy theme with some excellent artwork and background fluff. Unfortunately, some of the core mechanisms of Incursion appear to have been lifted from that second edition of Space Hulk. And that's a problem. The basic premise is that World War II is still raging. The Germans have managed to harness dark magic to create an army of zombies. To combat this threat, the Allies have created power suits that their marines can wear. The game covers a campaign by a small group of these armoured marines infiltrating a German base to destroy the zombie-making facilities. Okay, okay. Zombies... (snore). 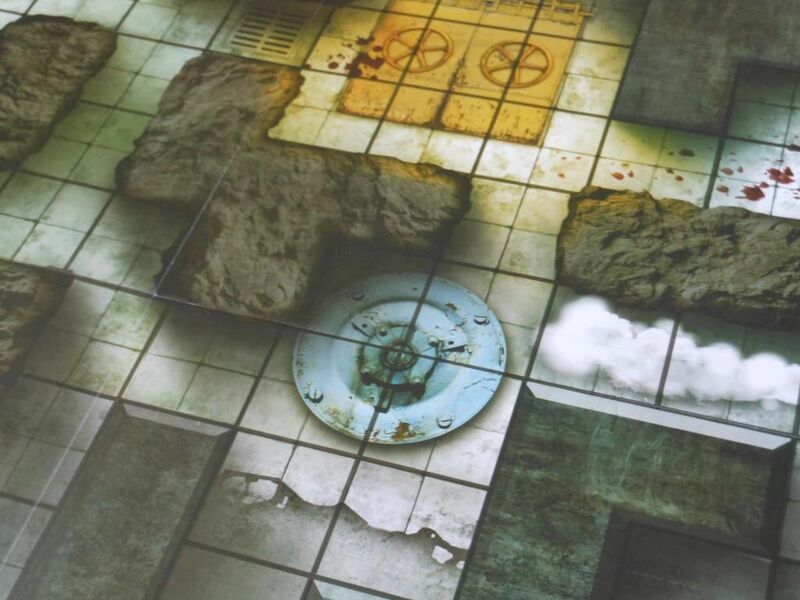 But other than that, it's a great idea for a board game, and reminds me of stuff like Hell Boy. The game is quite compact, shipping in a small box that contains a rulebook, player aid, double-sided game board, tokens, cards, and stand-up card characters. Yeah, that's right. Cardboard stand-up characters. I have absolutely no problem with this. 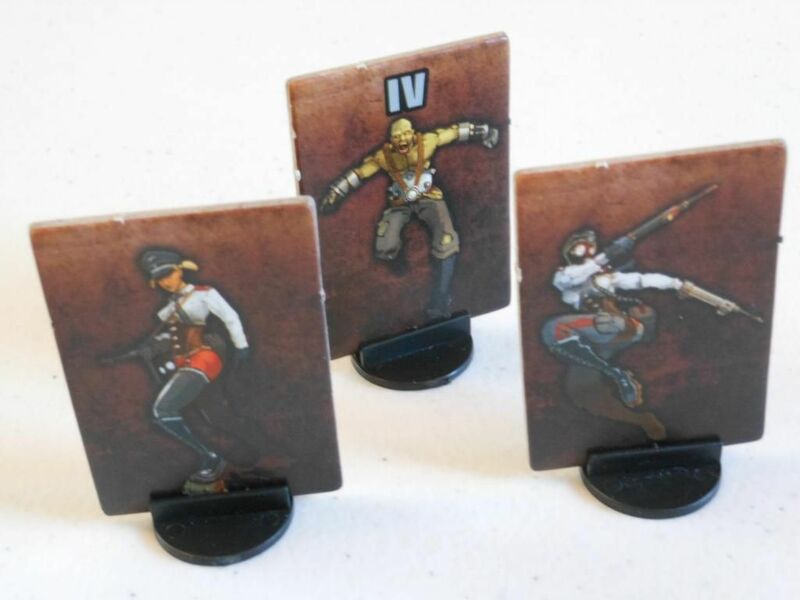 Miniatures are nice (and you could buy metal ones if you really wanted), but I would rather have a good game with nicely drawn stand-ups than a bad game with tons of plastic in the box. And these stand-ups really are nice, with some great illustrations. It is also very easy to tell which way they are facing, and as facing is important, this makes gameplay smoother. Other components are a bit more troublesome. The board is nice and study, but it offers only two different map layouts rather than being modular; and the cards have square corners and black borders, which is never good when they need to be shuffled. But Grindhouse Games is a small company, and the strength of the game was never going to be in the production values (which are actually very good considering), but in the rule set. This is a very lean, streamlined game. 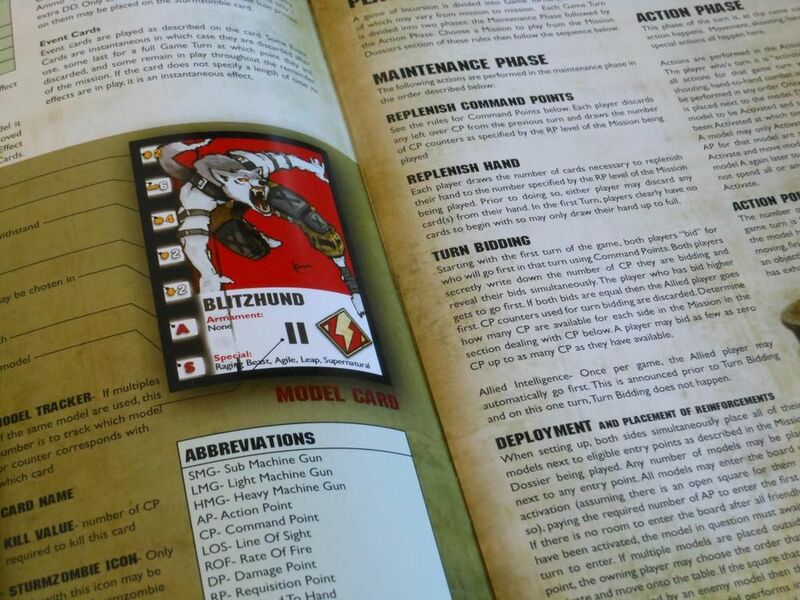 The rulebook is just 24 pages, and that includes all the scenarios, background fluff, and unit descriptions. The rules are really only 6 pages (including diagrams and artwork). There is an A4 reference card included in the box, and that contains pretty much every rule on it. You could read the reference card and start playing straight away. That's excellent. The rules - beautifully laid out and clear. Of course, the reason the rules are so straight forward is because the game shares a lot of mechanisms with the super-streamlined game of Space Hulk. The core concept is that both players have units under their control. A unit gets a certain number of action points to do different things. For example, moving one space forwards is an action point, opening a door is an action point, turning around is an action point. More powerful actions cost more action points (throwing a grenade takes two actions). You can supplement your limited action points by using command points from a pool that gets replenished every turn. Command points can also be used in two other ways. First, at the start of each round, players will secretly bid for initiative using command points. The person who bids the most will go first, but will have fewer command points (and therefore actions) on his or her turn. On a turn, players can also play cards that provide tactical advantages, and command points can be discarded in order to "kill" the card before it can take effect. And that's pretty much it for the rules. The game is scenario based, so in each game both players will be given an objective to complete, then you set up the board, select your units (you get a certain number of points to spend), and start playing. 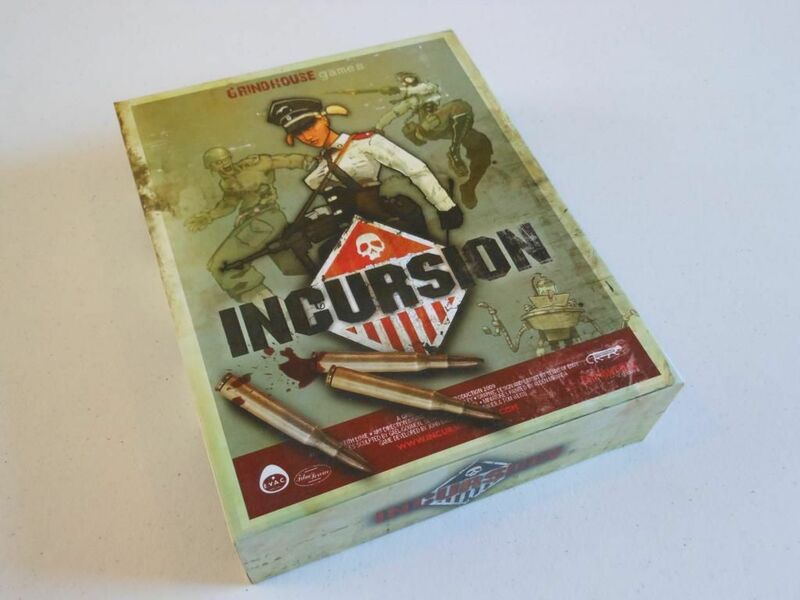 Technically, the game is more in-depth than Space Hulk, as the use of command points and cards provides additional choices; however, while I really enjoy Space Hulk, I cannot recommend Incursion. Detail of the game board. Don't get me wrong, I think there are lots of reasons to like this game, and I know there are a lot of fans; but for me, this game was a dud. There are simply too many mechanisms that just don't work quite right. First up, you have the battle cards. Every turn you get to draw a number of cards (based on the scenario). These cards are drawn from a common deck, and not every card works for every unit. Certain cards only work for zombies, certain cards only work for units with ranged weapons, and so on. I have lost track of the number of times I have drawn cards I can't use, while my opponent has drawn incredibly useful cards. I think it would have been better to have two card decks: one for each side in the conflict. The other problem with the cards is that they are free to play, and you always redraw at the start of the round. You could hold back cards for the right moment, but you are technically denying yourself lots of additional actions by doing so. You are better off using every card you can as soon as you can, so you can cycle through the cards and do more things. It just doesn't feel as strategic as it should. The next problem is one that is inherited from second edition Space Hulk: There is no time limit for the marines. Adding a time limit adds so much enjoyment and stress. When you are under pressure, you really have to think on your feet, and you are more likely to make a silly mistake just because you don't have the time to sort things out properly. This is so much fun, and there is so much laughter around our table when Space Hulk is being played. You don't get that with Incursion, and it makes the game feel a bit slow and tedious. Another major problem relates to those command points. While you may sometimes spend a lot of them to ensure you go first in a round, in my experience the best idea is to hold on to as many as possible to "spam" them on your turn. There is no limit to how many command points you can spend on any unit, so you can create some ridiculous results. For example, in my last game, my opponent had 6 command points. He also had one additional command point from having a sergeant. Furthermore, the sergeant can "give" all his four action points to other units. That's 11 command points to spend. My opponent used all 11 on a single unit (which also had 3 action points of its own). 14 activations in a single turn. Considering the marines are supposed to be slow-moving, the ability to cross the board in a single turn is potentially game-breaking. Command point spamming is particularly problematic in early rounds (when neither player is prepared to waste points to win initiative), and in the one round per game when the Allies get to choose to go first without needing to bid command points. The last major problem relates to overwatch. Sorry, I mean reaction fire. In Space Hulk, you could pay action points to set up your marines so they could fire in the enemy turn. In Incursion, you don't need to pay anything. If you can't see an enemy at the end of your turn, you go into reaction fire for free. From then on, if an enemy does something in your line of sight, you get to make a free attack. You can do this every time an action is taken, as long as you don't roll any doubles (as this indicates you have run out of ammo). Oh, and did I mention that some units can do reaction fire using only one dice, meaning they have unlimited ammo? Okay, I guess by now you can see I'm not a fan, so I suppose I should sum up. I really like the theme of this game. I love the artwork. I love the fact you can get the entire rule set on a single A4 card. The ability to be able to learn and teach the game in 10 minutes is fantastic. The card components are of good quality, and the board is very nice (but limited). I like the idea of battle cards and command points to add more tactical options. I can definitely see why some people would like the game, and I guess my suggestion is that you should try before you buy. Unfortunately, I just don't like the game. The cards and command points make everything too swingy, and I don't get a real sense of tension when playing. However, the simple rule set does mean you could easily make house rules. You could limit command points, you could add a timer, you could remove the battle cards, and you could add a cost for reaction fire. But then, of course, you're playing Space Hulk.